This scenic Colorado town of Castle Rock is named for a small but prominent butte in the middle of town. Castle Rock residents enjoy a wonderful quality of life, with spectacular views of the Front Range and all the terrific recreational opportunities the mountains offer. 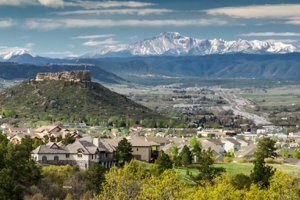 Add top-quality schools, neighborhood parks, a vibrant downtown and easy access to Denver and Colorado Springs, and you can see why this is such a desirable place to put down roots. One of the original homesteaders, Jeremiah Gould, owned 160 acres to the south of "The Rock." At that time, the community consisted of just a few shacks for prospectors, quarry workers and other hired hands. In 1874, Gould donated 120 acres to "be known as Castle Rock." It was then that the six streets named Elbert, Jerry, Wilcox, Perry, Castle and Front were laid out. The Courthouse Square was designated and 77 lots, each 50 by 112 feet, were auctioned for a total of $3,400. Within a year, the new train depot brought the Denver & Rio Grande Railway to the community. Soon, it was unloading supplies for ranchers and shipping rhyolite from the three local quarries and cheese from the dairy farms in the surrounding area. The depot now houses the Castle Rock Historical Museum on Elbert Street, where visitors can relive the 125 years since the Town's inception. Castle Rock has continued to prosper and grow with many new shopping areas, office space, recreational opportunities and more. See below listings for Castle Rock homes for sale.